It was three years ago I discovered the Kickstarter campaign of a filmmaker named Nickolas Rossi. He had a vision of creating a documentary film about singer/songwriter Elliott Smith that would be less drama about his life and more music focused; what came to be known as a “love letter” to Elliott Smith. And as I followed the path of creation that became the film Heaven Adores You, it was evident every step of the way that this project was being done with the utmost love, respect and admiration for Elliott and his family and friends as well. And finally the time arrived for me to be able to view this film that I had literally been counting the days to see. 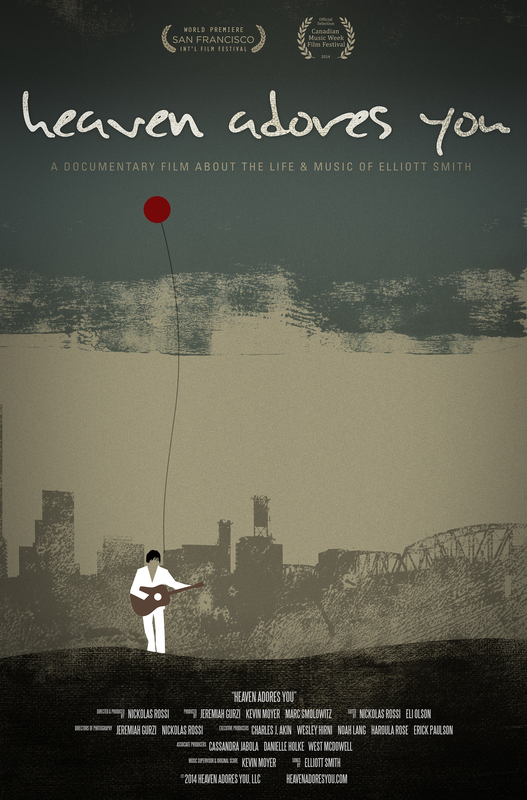 The screenings have been at various film festivals literally all over the globe, which is a testament to the worldwide appeal of Elliott Smith’s music. But last night was a very special screening I attended, the showing of the film in Portland, Oregon, a city that is widely held as Elliott’s hometown. The theatre was packed, a sold out show, and the energy of breath-holding anticipation for Heaven Adores You in Portland was palpable. After a lovely set of Elliott Smith songs performed by the Portland Cello Project it was time to see the film that so many have waited to see. What I watched for 104 minutes was a very well crafted tribute to Elliott showcasing his music not just from his days of fame but also treating the viewer to some rare songs from his adolescence where it becomes obvious that he had the seeds of musical talent and genius ready to sprout. Heaven Adores You is also well seasoned with snippets of commentary and memories from Elliott’s dear ones that shared in his lifetime. I found myself in more moments of laughter than tears as I watched this film, not being awash in the usual drama and darkness that is often attached to the telling of Elliott Smith’s lifetime. And then there is also the visually stunning cinematography that adds to the breath and depth of Elliott’s journey in the various places he lived and created and played his lovely music. Heaven Adores You is the ultimate gift of tribute to this lovely troubadour who left us all too soon; it is a fitting homage of love to a man who was really just all about love himself. You’ve come a long way baby! Well, maybe not..